Msgr. Schaedel is awarded Knight of the Month by Grand Knight, Al Capuano. Leading by example, Msgr. 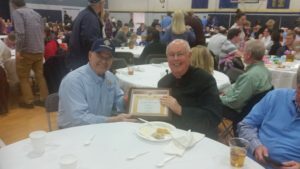 Schaedel transferred his longtime membership in the Knights of Columbus to the St. Luke council hosted and hosted a membership drive event at the St. Luke rectory.